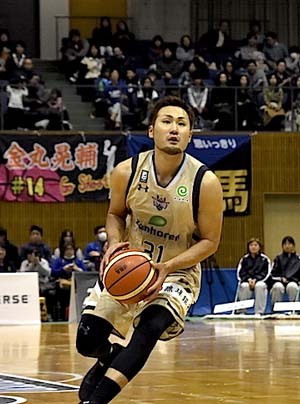 Ryuichi Kishimoto led the Kings Sunday with 23 points. 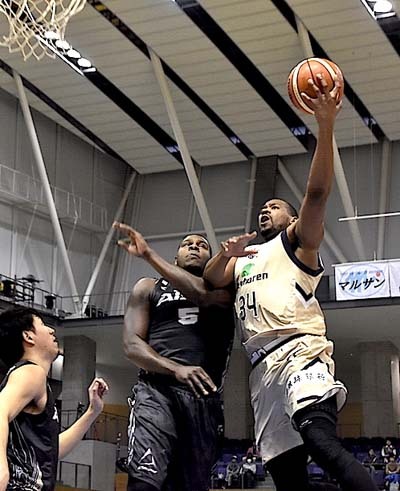 The Ryukyu Golden Kings played a pair of weekend road games in Kariya, Nagoya Prefecture against Seahorse Mikawa, the top placed team in the Western Conference, and were swiped both days slumping to the 5th place from the 4th in the conference. Lamont Hamilton making an attempt at Mikawa’s hoop. On Saturday, the Kings still could not get their game going from the start, the same way as in their last couple of games. The team was unable score while the opponent kept on piling up theirs, and at the end of the 1st quarter, Seahorse Mikawa was leading with double the score of the Kings, 17-34. In the 2nd quarter, confident Mikawa benched some of their main players to save their energy, and although Kings’ Morihisa Yamauchi made a mighty effort and managed to make the gap bit smaller, Mikawa still worked well and the score at the end of the first half was 44-57 for the hosts. After the halftime, Mikawa’s main players came back to the court, and the Kings could not get their game going at all. The final score was 88-100 for Seahorse Mikawa. On Sunday, Mikawa Seahorse beat the Kings again 86-92, and the loss pushed the Kings to the 5th place in the conference. The Kings won only one of their seven games in November losing six. 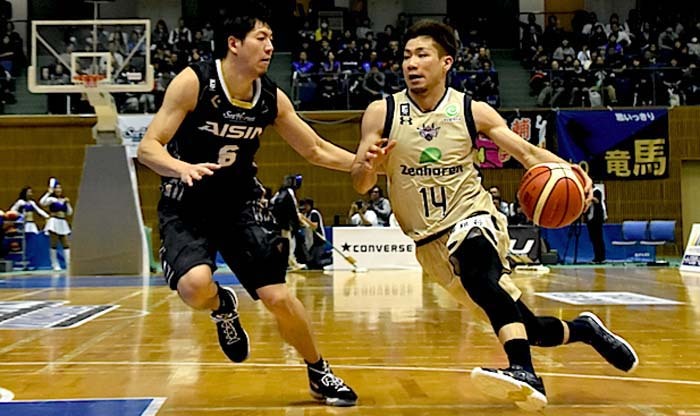 Shuhei Kitagawa made an 18-point effort on Sunday. In all honesty, the game was not as bad for the Kings as the Saturday game. The gap between the teams did not spread too large in the first half, and the team managed to come close from behind once in the 4th quarter. But at the end, they missed a number of shots, and gave an important win to Mikawa. Tsutomu Isa, the head coach of the Kings, said that although the Sunday match went better than Saturday’s, he’s the one who should take most of the blame. “On Sunday, the final result was up to head coaches’ handling of the game, and that was the difference between the teams. The game was a seesaw game, and both teams had a shot at the win, but the final result was my fault. The game was nice and the audience was pleased anyway,” Isa said after the game.